I had heard of this show but never seen it before and it isn't the kind of show I usually watch but Scandal is a decent show and I liked it .I think it is very well done but personally I don't think this is one I would watch again but not because it isn't a good show but because it just isn't the kind of show that keeps my attention. If you are a fan of this show I think you will want to get season 2 on dvd and if you do make sure you watch the features as well. 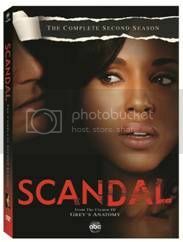 If you want to purchase Scandal season 2 you can now do so in stores.